File this one under truth is sometimes stranger than fiction. How a member of one of America’s richest families comes to murder an American Olympic star is one of the strangest tales ever told and even with the liberties taken with time lines and some of the actions on screen, the story remains true to life and true to being very bizarre. Almost unrecognizable under make up and facial prophesises, Steve Carell as John Eleuthère du Pont drops the dry funny man stick and delivers the performance of his career, albeit a very creepy one. From his first frame to his last, he fills the screen with a sense of dread and odd demeanour. du Pont, a member of one of America’s richest families (a fortune initially made through the sale of gun powder) is surrounded by yes men and the privileges of wealth. du Pont is a fan of wrestling, not the flashy show biz variety but of the form called Freestyle Wrestling, one of the two styles practiced in the Olympics. 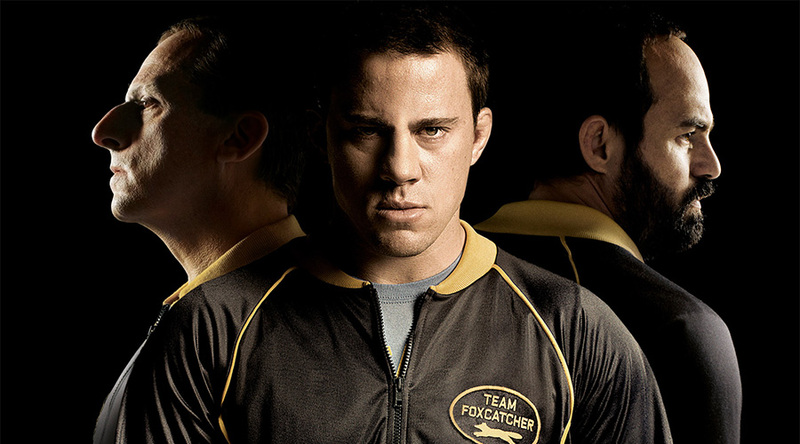 He comes in contact with the Schultz brothers, Mark and Dave (played by Channing Tatum and Mark Ruffalo) and gets them to join his obsession with the sport. He wealth allows him to provide training facilities and a lifestyle that the two brothers could have only dreamed about in their youth. The film compresses the real life story of almost a decade down to a matter of years and keeps the dread at the forefront. This oppressive structure is kept intact the entire film and as such it’s a very powerful experience but not a particularly fun one. For those seeking light and frivolous entertainment, perhaps best to look elsewhere but for those that want to share time with a group of actors working at their highest level telling a story so bizarre it almost defies belief, don’t miss Foxcatcher.